Well, after having no rain at all for the first 15 days in August, the last 2 weeks has made up for it! The last update on the Phuket weather blog was August 22nd, which was itself quite a nice sunny day, only with wet roads and minor floods (see that last update for some photos) caused by 200mm of rain the night before! Nothing serious, and the "floods" mostly gone by the afternoon. The word "flood" is easily misused and misinterpreted, some local news reports were typically over sensational. I actually saw no flooded roads between my house (Kathu, near Phuket Town) and Karon Beach, 20km away. Phuket Town got wet, but local people there told us the water was gone by mid afternoon, so headlines like "Phuket floods damage roads, pull down power poles" are too much. Maybe 1 or 2 small sections of road in the whole island damaged and 2 power poles fell down, but a headline makes it sound much worse. Truth : Heavy rain and minor flooding with minor damage to roads and property in some areas. Life not affected in any way. Off my soapbox, I know news has to sell itself. Anyway, the last 6 days have been pretty wet, with patches of sun. August 23rd started sunny, or at least not too cloudy. I Tweeted "Phuket weather right now - light grey with the sun trying to make an appearance. ", but later on the 23rd (last Thursday) the rain came in again, nothing much, 29mm falling during the afternoon and night. 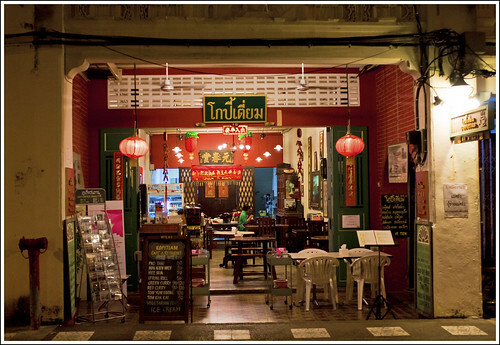 We dodged the raindrops in Phuket Town and went for a coffee at the Kopitiam cafe on Thalang Road in the old town. Friday 24th was mostly grey, not wet .. again with rain falling in the night. Saturday started nice and sunny, our kids went to (rock) music lessons and we drove up Rang Hill for some fresh air. Kids wanted to watch a movie at the cinema, and we saw that 'Brave' would be showing at the multiplex cinema at the Central Festival mall. Before that I had time for a quick dash into Phuket Town. 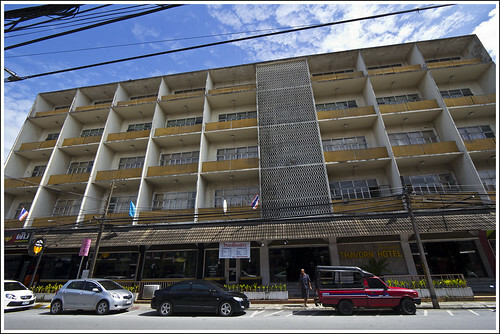 I wanted to get some photos of the Thavorn hotel which opened in 1961 and was Phuket's first 5 star hotel. 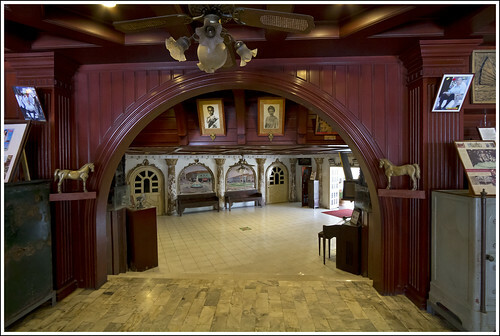 It's not 5 star now, you can get a room for as low as 600 Baht, but downstairs the lobby still looks quite grand, and they have a kind of museum, a room full of old relics. I'll blog about it sometime soon. Brave was good and the whole family wiped away a tear. For movie schedules, check here. Useful for a rainy day. Actually when we went into the cinema, it was still sunny. When we left it was raining cats and dogs. Didn't rain all night, but raining hard when we got home. At which point someone had to sacrifice their dryness to go open the gate and you start to think that an electronic gate would be very cool. Sunday 26th - grey with patches of wet. I did not go out taking photos of the rain and grey skies, by Sunday I was feeling a bit sh*tty with a red eye, sore throat and swollen glands. I went to work on Monday but wished I hadn't! Aside from not feeling too great, it was a really wet and windy day, one of the crappiest of the year! Total rain for Monday (measured 7am Monday - 7am Tuesday) was 112mm. Boats should not really be out in that weather - a speedboat sank between Phuket and Phi Phi, thankfully with no casualties - see news here. It's Wednesday morning now, and sunny. I was at home yesterday and still at home today, not feeling too healthy still with swollen neck and bad cough. Need another cup of tea and probably some antibiotics too. Poor me! August has been a game of 2 halves. 15 dry days, and since the 16th we've had 600mm of rain according to my rain gauge. Wettest August on my records, going back to 1998. Over half of that total was on just 2 days though, so it's not like we've had constant rain. Saturday was mostly nice for example. I think we'll get another spell of good weather now. Today is turning out nice. But I don't suppose I'll leave the house, gotta get better!